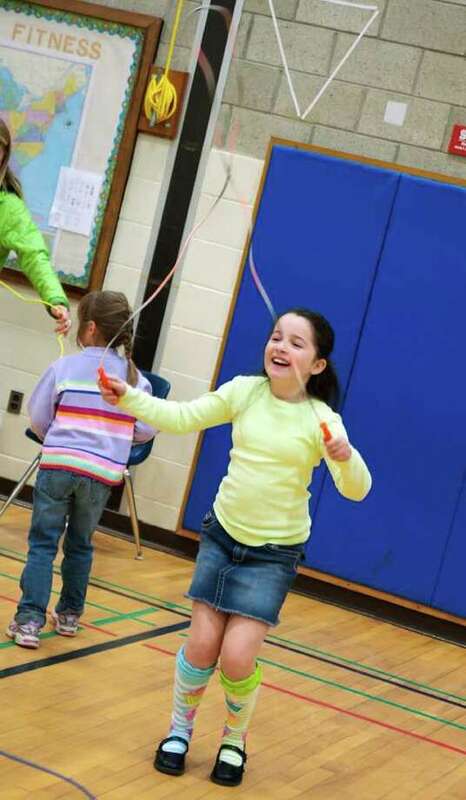 Ellie Capalbo, a 4th grader at Holland Hill Elementary School, enjoys the Jump Rope Club, which meets for 15 minutes prior to school on Tuesdays and Thursdays (December through March). Children at Holland Hill Elementary School are getting the jump on learning -- literally. More than 30 students begin the day not in a desk, but in the gymnasium skipping rope. Sponsored by the Holland Hill Wellness Committee/PTA, the Jump Rope Club meets every Tuesday and Thursday prior to first bell. "It gets their juices flowing before they have to sit down and be still all day," said Laura Fuhr, who has twin daughters in first grade. The sessions are only 15 minutes, but that's enough to make a difference, according to wellness committee member Tracie Valentino, a Tuesday volunteer. Teachers have had good things to say about the positive impact of the club. "They rave about the kids coming in with more energy and being more alert," Valentino said. The twice-a-week program runs from December through March, when children are outside less often due to colder weather.